Every 365.25 days, the Earth revolves once around a star we call the Sun. Approximately every 225 million years, the Sun revolves around Sgr A* (pronounced “Sagittarius A-star”) which presides at the center of our Milky Way Galaxy. 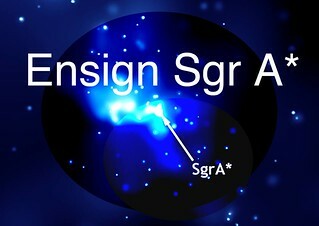 It is now theorized that Sgr A* is not actually a star but a supermassive black hole that is currently eating planets, stars, light and even smaller black holes. Of course, the thought of an unseeable thing / dimensional portal actively swallowing our galaxy is keeping me awake some nights. Meanwhile back in Long Island City, Radiator Arts and Over The Opening (OTO) are pleased to present Ensign Sgr A* featuring artist using negation and absence as ensigns or banners for states of exploration and loss. The exhibition operates as part wunderkammer and part memory hole with past prime astronomy, geography, technology, and superstition as the backdrop. Battles will be fought and journeys begun but broken and disappeared, in the long view of time, approach. Amelia Bauer stages alien nocturnes in the Western landscape. Joianne Bittle shows space age couture and found prehistoric displays. Aviram Cohen sets contact mics to trace invisible pathways. G.H. Hovagimyan forms ARs for floating zombie teen avatars. Nicholas Knight renders codes. Esperanza Mayobre maps points with no return. Jennifer and Kevin McCoy scan future ruins. MTAA prepares to disappear. Shannon Sberna sees hypnosis and future luck. Raphaele Shirley enlightens worlds and historic technologies. Janice Sloane performs and documents dark acts. Colleen Rae Smiley sews signals and Charles Orr with OTO design a graphic to inform and educate. From the fall of 2007 until the winter of 2009, the artist collaboration MTAA invited artists and art collectives to present one-night exhibitions of time based art in their North 6th Street Brooklyn studio. This ongoing monthly event curated under the name Over The Opening (OTO) operated as a blurring of studio space, exhibition venue and social experiment. The artists who worked with OTO represented a diverse array of practices. Works ranged from a tamale making workshop, to endurance karaoke to experimental computer games. Over the years, OTO presented 26 exhibitions of expansive scope with modest means. Ensign Srg A* at Radiator Arts marks the first OTO exhibition in a gallery setting.